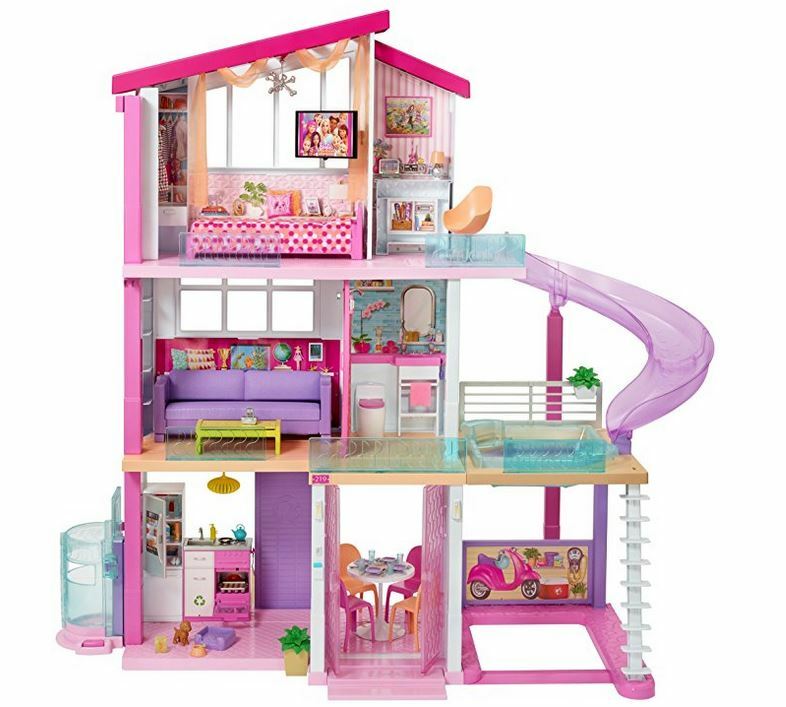 This Barbie Pink 3-Story Dream Townhouse is full of role-playing fun! Everything you see in this house is functional, from the lights to the tub, the fireplace, name it! Barbie can even entertain her guests by cooking dinner for them or having a Jacuzzi party! It’s busting at the seams with adventure and endless hours of great fun. Let’s start our tour of this house on the ground floor then make our way up through the elevator. Then, we can see what this new fantastic dream house have. If your parents have the old Barbie house back in the ‘70s, then you will also find more astounding features in this new one. Upon your entry on the front door, you will be astounded by a glittering chandelier that is effectively rendering a homey atmosphere to this town house. The first floor is where the dining area and the well-stocked kitchen are found. Unlike other toy houses, the kitchen accessories are not painted on the walls but actual little things. You might hear a kitchen timer clicking when the cooking has been done just like the kitchen timer sound in your own home. Open the refrigerator, and it will light up just like a real one. There is a nice dining set in the dining room for Barbie’s guests. The second story of the house is where the entertainment is. Barbie and her friends can pop some movie and watch it on her flat-screen TV. The fireplace is not just a wall props. You can hear the crackle of fire there too. Perfect for snuggling on a cold night! There is also a signature bathroom in this level. The toilet emits a flushing sound as well which is as close to reality as it can get! When Barbie is taking a bath, you can hear her humming in the shower. Almost everything in this house seems realistic. All the tiki lights light up, and the sounds are just almost like the real thing! Here you will find that Barbie has a canopy bed in her posh bedroom. She can rest in her stylish bed after a day of entertaining friends. She can also relax on the balcony that has tiki lights. Or take a dip to ease away the day’s stress in the outdoor whirlpool tub. The Jacuzzi is like a mini version of a real one complete with the gurgling water that will soak up Barbie’s tension. To take Barbie from one story to the next, there is an elevator that your child can pull. It is situated in the side for easy access. There is a string that the kid can pull to take Barbie up or down her 3-story house. There is a doll stand inside the elevator to support the doll as she goes up and down. The new Barbie Dreamhouse is an excellent option if you’re looking for a gift to surprise your girls with on a special occasion, as many reviewers say. The three floors, eight rooms, and other areas leave a lot of possibilities for your children’s imaginations and pleasure. The current DreamHouse model has a stronger foundation than the previous ones and is less likely to fall apart. It even comes with a rooftop pool and a slide that your children can use with their dolls that have delighted kids all over the nation. The pool part can be detached and filled with water very easily. The house is quick to construct and spacious enough for your kids to enjoy, even with their friends. Many reviewers speak of the joy of seeing their little girls playing with this together. It does not come with the doll itself but has a wide array of household tools to play with. The only downside to this, however, is that it comes with a few small pieces. So, you need to be cautious that your children don’t put them in their mouths. All in all, the beautiful colors and the overall aesthetics of the new DreamHouse guarantee a pleasant experience for your children, and you can put your mind at ease knowing that your girls are anything but disappointed with your gift. As a testament to this, countless reviews are speaking of children’s faces light up when they’ve received this. As versatile as it is entertaining, this is a playset that will surely leave your kids dazzled for hours! There’s a lot to love about the Barbie Dreamhouse, and I found multiple notable things worth mentioning upon further research. For one, customers have stated that the current Dream House is sturdier as compared to the earlier models released to the market despite being made out of plastic. Be prepared though since this product takes up a lot of space, literally! Towering at 3 feet tall, it consists of three fully-furnished stories equipped with all the furniture necessary to play-house. Even minute-details are provided including kitchen tools and other types of equipment, even sound effects for a full-hand experience! Since it’s made to be re-arranged, placing it against the wall is out of the question. You’ll need to put it at a large and open space so you and your kids can utilize all its feature. Not to worry though, since the Dreamhouse comes with a manual easy enough to understand. Assembly time takes about around half an hour to quarter an hour. Since it’s also made out of plastic, the product is very light and can be moved with ease. In addition to that, the multi-functional furniture such as the couch that can be re-arranged to make a bunk bed and coffee tables to turn into beds. Full-equipped with the smallest accessories as it is, the only drawback for that is it contains many small arts that are choking hazards. So if you have little ones that tend to put things in their mouths, it’s best to stay attentive to what they’re doing. These features will delight any fan of the Barbie fans out there. If you plan to add this to your Barbie collection or get your kid one for Christmas, don’t wait before stocks run out. Inevitably, as the holiday season approaches, this will be harder and harder to find. All in all, the Barbie Dreamhouse is the perfect package to present to your kids!